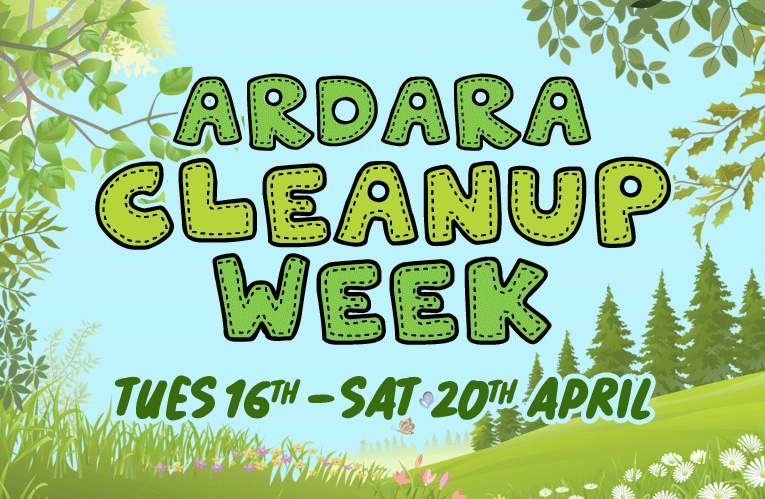 There will be a Parish Cleanup from today Tuesday 16th to Saturday 20th April in Ardara with the Big Cleanup Day on Saturday. Please come out and collect litter in your area. If everyone did a mile around their area, it would be great. Gloves and bags will be available from Noleen at the Community centre from 9am to 1pm during the week. If anyone is interested in cleaning at any other time, contact Stephen on 0872424590 to make arrangements to collect cleaning equipment, bags etc. For the main collection on Saturday 20th, people are asked to assemble at the Community Centre at 11am to receive their bags and gloves. For more information contact 087-2424590. As you are all aware Owenea FM is back in operation and in the coming weeks we will be seeking support in the form of sponsorship from all businesses in the Ardara, Glenties and Portnoo catchment area. With that in mind we have enlisted the help of Anne Gildea, Glenconwell to call with all current and potential sponsors. We look forward to your continued support for our Community Radio. We would like to take this opportunity to encourage all groups organising charity events or such community activities to provide details to the station so that we can broadcast the news to a wider area. Please send any news items you wish broadcast to Tommie O’Loughlin on email: tolliver2@gmail.com. 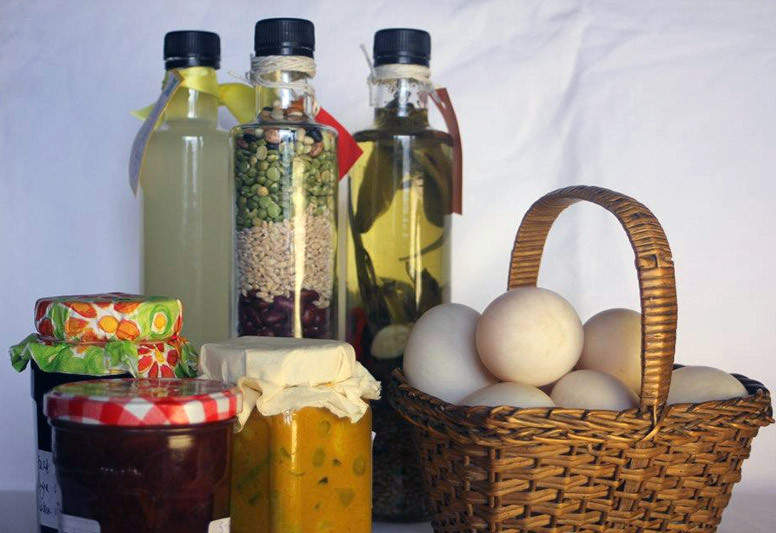 Kilclooney Country Market are having their Easter Market on Sat 20th from 11am until 1pm. Why not drop in and enjoy all our tasty home bakes, lovely handmade jewellery, homemade jams and chutneys and lots of other goodies. Our monthly club meetings are now running upstairs in the Heritage Centre Ardara from 7.30pm to 9 30pm on the last Friday of the month. €5 Per month. Refreshments provided. Ring Sue on 0860773359 or email ardaracameraclub@gmail.com for further details. Everyone welcome. We also need models for us to practice on. Local culture i.e. weaving, painting, or anything local craft related. Just for occasional practice at the club meeting for an hour. We can’t pay but are happy to give a photo or two of their choice for them to keep. Can be male or female or small group. Parkrun is for everyone. Come and join in. Starting in May 2019. Free timed 5km walk/run. Parkrun organise free, weekly, 5km timed walks/runs around the world. They are open to everyone and are safe and easy to take part in. Narin Beach Parkrun/walk 5k will take place every Saturday at 9.30am. All runners/walkers welcome. Participants required and volunteers wanted. 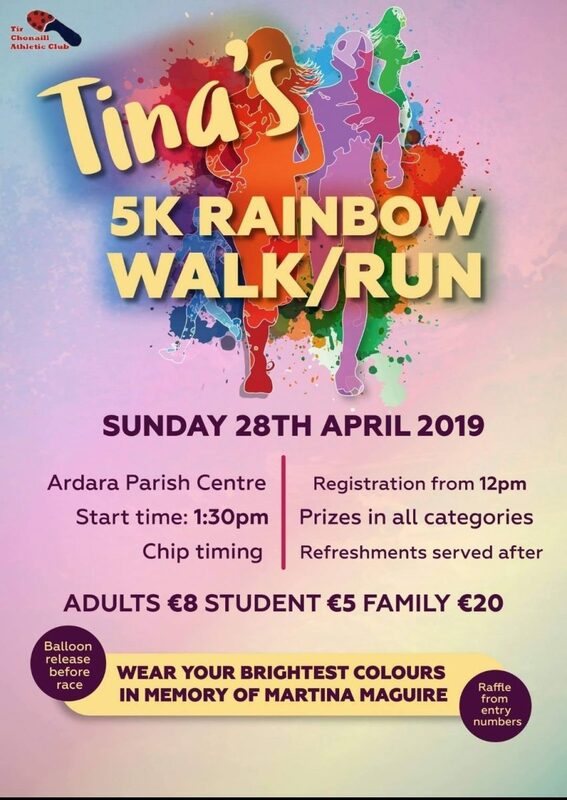 Tina’s 5K Rainbow Run/Walk is taking place on Sun 28th April. This run/walk is in memory of the late Martina Maguire, and begins from the Parish Centre at 1.30pm with registrations from 12 noon. There will be prizes in all categories. Refreshments will be served afterwards in the Parish Centre. Chip Timing will be in operation. Participants are asked to wear their brightest colours to reflect Martina’s bubbly and fun personality. The Cup of Tae Traditional Music Festival takes place Friday 3rd to Monday 6th May, and brochures are now available locally. 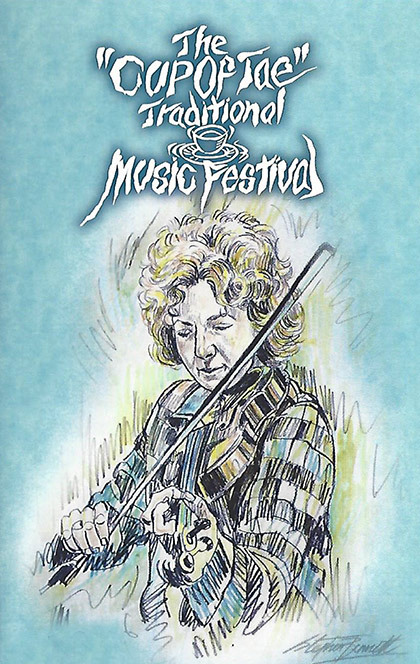 This year the Festival honours Brid Harper – one of the most acclaimed fiddlers in Ireland, and it promises to be the biggest and best to date, with Workshops, Schools of Music, Concerts, Sessions and Street Music all weekend! View the Programme of Events on our Cup of Tae Festival page. For more information visit the festival website cupoftaefestival.com. The organisers of the Ardara Walking Festival will be hosting a guided hill walk from Port to Maghera, one of the most spectacular coastal cliff walks in Europe, on June 1st 2019. Tin Whistle Classes for beginners will take place in Ardara if enough people are interested. Dates to be decided. Anyone interested in learning to play the tin whistle should contact Colm on 087-3222910. Dates are yet to be decided and booking is essential. If you are interested in any of the above please contact Colm on 087-3222910. A Wellbeing and Relaxation Clinic started in the Community Centre on Friday 12th April and will continue every second and fourth Friday. A part time secretary is required to work in two schools in Ardara. The post is for 20 hours per week equally shared between Gortnacart N.S. and the Wood N.S. Knowledge of accounts, wages and computer necessary. The successful candidate will commence work on Monday 2nd September. Closing date for applications is Thursday 25th April. Applications by email only to schoolsecretaryardara@gmail.com. Shortlisting may apply. If you would like to advertise with us for the upcoming year, from 1st of May 2019 until April 30th 2020, you can contact Brian on 087-7474775. A story or background of your business. 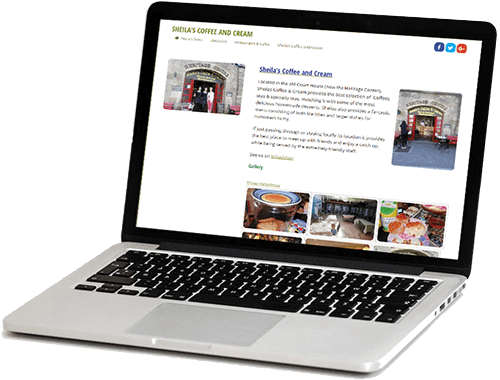 Gallery of photos or videos of your business. Included in “Selected Listings” section on our front page and “About Ardara” page – linking to your page. Direct links to your social media pages. Facebook & Twitter sharing buttons. Phone Brian on 087-7474775 or get in touch via our Contact Page. 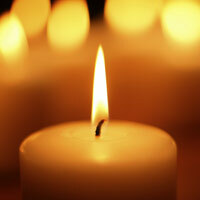 The sympathy of the Community this week goes to the families of the late Eamon Kennedy, Cashel; Jamsie Gallagher, Crumlin; Fr. Frank Molloy, Tullycleave; Packie Johnny Gallagher, Meenakillew; the McGill Family, Maghera & Monargan on the death of John Collins, Enniskillen; Packie Cunnea, Glencolmcille.